Finding the ideal house plan to meet your lifestyle and needs may seem time-consuming or overwhelming, but knowing what to look for can help lead you to success when building your new home. Do you like how the house looks on the outside? If not, can you change the exterior to suit your preferences? Stucco, siding, brick. A home’s exterior is often the easiest thing to change. Don’t rule out a good plan if the exterior is the only thing that concerns you. Your home will be more energy efficient if the layout of the plan takes advantage of how sunlight falls on your lot. In North America, the longest side of a home should face south. The best place to have windows is on the southern wall of a home. The living portions of the home should be towards the south. The north side of a home receives less light and less solar heat and is better suited for storage rooms, garages, utility rooms, lesser used rooms, and rooms with fewer windows. You may want to have the rooms oriented to follow the sun. For example, if there are rooms you mainly use in the morning you may want those on the east side of the home. The rooms you use in the afternoon or evening could be on the south or west parts of the home. Is there anything about the plan that may make it harder to sell your home to a future homebuyer? If so, can you modify it or change it to improve the resale value of the home? Don’t make your home so custom that you create barriers for future sales. Consider your current and future space needs. A room needs to have enough space to fit comfortably the furniture and allow traffic flow. If you are planning to have children, consider buying or building a home that has enough space for a larger family. Try to get rid of wasted space. Poorly used space still cost money to build, heat, and cool. Hallways tend to waste space. Plans with fewer hallways or shorter corridors tend to have more useable space. If you have a walk-in closet, it may not provide much more storage than a smaller closet would. The area used to walk into a closet typically provides no storage space. Are there rooms you will rarely use? If so, perhaps the functions of those rooms could be replaced by other rooms. For example instead of having a formal living room perhaps you may prefer a larger family room. Look at the areas that will commonly have traffic or be the most congested areas of the plan. Are there any places that doors or room relationships will make traffic patterns complex or congested? Are there any places where doors can open and hit each other? Look at the paths you’ll commonly take through the home. If you have to turn a lot of corners, the traffic will not flow as well. How wide are the hallways and stairways? Wider hallways and stairs are more comfortable and easier to use. Also, look at the room relationships and how they will affect traffic. For example can you carry groceries from the garage to the kitchen without having to go through other rooms? Can you readily access a bathroom from any bedroom? Can guests easily access the back yard without having to go all the way through the home? Can you get to the most commonly used rooms without having to go through the kitchen? If you have beautiful views, then you should consider what rooms you’d like to see those scenes. A plan with rooms at angles or rooms clustered around the view may allow more rooms to take advantage of a pleasant view. Keep in mind you can often change the window sizes of the rear elevation to suit your needs. A home’s shape influences the views, privacy, size and shape of outdoor spaces. For example, if you want just one large outdoor space near the rear of the home then a square or rectangular home can create this type of space. Sometimes a home with rooms that extend out from the home’s primary shape can create desirable outdoor spaces. For example, if you want a more private deck in the back yard then you may want rooms that extend out from the home to help create a more private deck. Does the plan have enough storage space and convenient storage for items you need to store? Where will you put cleaning supplies like a broom or vacuum? Do you need a pantry in the kitchen? Are linen closets conveniently located near the bathrooms? Do you need storage for seasonal items such as Christmas ornaments? Where will you store the coats and shoes of guests? Where will you store smaller appliances such as irons and hairdryers? Where will you store recyclable items? Also, consider your future needs. Will the home be able to support your storage needs as your family grows? It may be a good idea to have flexible rooms that are used for many purposes. For example, you may want to have a closet in the office. This lets the office also be a potential bedroom. This helps protect the resale value of the home. A future homebuyer might not need an office but having an extra bedroom might be appealing to them. If you have an exercise room, then consider putting a phone line and television cable in the room. A future homebuyer may not want an exercise room but might wish to use the room as a family room or an office. If you want a home library, then consider making the bookshelves removable so that a future homebuyer could easily convert the library into a bedroom. Will the floor plan of your new home plan accommodate your existing or new furniture arrangements and furniture styles? When planning room sizes carefully consider the seating areas and how furniture placement will affect the overall feel of the room. Do you want two separate seating areas or one larger conversation area? How will the room flow into other rooms? Measure your current furniture to determine if there will be adequate walking space of at least 36 inches around furniture and clearance for doors to swing. Will the height of your furniture block windows? Does it provide enough wall space, nooks and areas for art and personal effects? Remember to provide adequate walking space of at least 36 inches around furniture. Be sure you provide clearance for the swing of doors. Also consider the height of the furniture and determine if it will block windows. Look at the paths you’ll need to take to move furniture into the rooms. Will it be possible for you to move the furniture to the places you want? Sometimes sharp corners and narrow hallways can make it impossible to move large furniture into a room. Therefore, before choosing a new house plan, we suggest that you ask yourself a number of lifestyle and living needs questions. Are you newly married? If so, do you have plans to start a family? How many children do you plan to have, is there room for expansion as your family grows. Will you need guest rooms for overnight guests? What about additional living space in the future to possibly care for elderly parents or grandchildren? 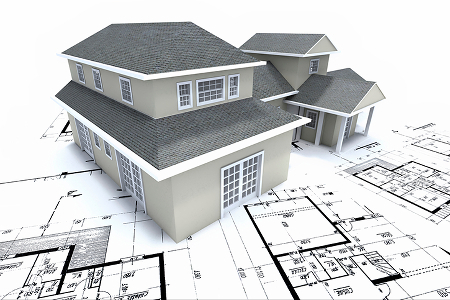 Study your house plan and lot area to see if it is possible to expand the house plan living space in the future. Think about the time you presently spend in your current rooms and why. Some families like to make the kitchen the focal point for daily family gatherings and would require a large sunny eat-in kitchen with lots of space, others prefer a den or family room with lots of room for large sofas and a fireplace. How do you plan to entertain? Do you want a formal dining room and traditional living room for large formal entertaining, or do you prefer small, relaxed family get-together. Look at the placement of windows and visualize how light will flow into the home. Are there any areas that won’t receive light? Also, imagine how you will be placing the home on your lot and how the sun’s light will affect the home and your activities during different parts of the day. Will you have adequate sunlight to put plants in a room? Do you want the morning sun to reach your breakfast room? If you don’t have sufficient outdoor light can you add a window or skylight or move an interior wall? Placement of the windows will also affect how large the home feels. Windows placed at the end of halls or doorways will let you look outdoors. This makes the home feel larger. If walls block your sight, then that part of the home will feel smaller. Also, do the windows let you take advantage of any nice views that you have? Using larger windows can also help a room feel larger. Keep in mind that you can often change the size, shape and placement of windows in a plan. Sound: How will sound travel through the home? Open areas will let sound travel more easily. Are there any noisy areas that will be near areas you want to be quiet? Are there any buffer areas to help reduce sound flow from noisy areas? For example, clothes closets between bathrooms and bedrooms can help deaden the noise coming from a toilet. Are there areas you want more private? People care about privacy in bathrooms, the master bedroom, and the office or den. Consider privacy from occupants and privacy from neighbors. Will your windows look directly into a neighbor’s windows? Does a neighbor’s second-floor window overlook your “private” back yard? Landscaping, lot type and location can play a significant factor in how much privacy your outdoor spaces will have. Where would you like to spend time with your spouse or significant other? Naturally the master bedroom comes to mind, but what about the master bath? Do you want a large whirlpool tub or 2-person shower? Do other areas of the home or outdoors need more privacy? Perhaps you’ll want a screened porch to camp occasionally outdoors. Maybe it would be nice to have a deck with a hot tub off the master bedroom. Do the relationship of other bedrooms in the home give you enough privacy? Maybe you would like a sitting room in the master bedroom. Perhaps you like a fireplace in the master bedroom or master bathroom. Where do you want to dine on special occasions? Keep in mind that features such as decks, porches, fireplaces, and whirlpool tubs can be added to most plans. Don’t rule out a plan if a feature you want is not shown in the plan. You can usually add more features to most plans. Are there areas you’d like to be open? Perhaps you’d like entertaining areas to open into each other. In particular, some people like having the kitchen be open to the family room or breakfast room. Having rooms that are open to other rooms will make the home feel larger. However, open plans also tend to be noisier and less private. The cost of building your home can vary considerably. Can you afford to build the home you have chosen? If it’s outside your budget, can you reduce the size or features of the home to make it affordable? Sometimes you can put off finishing some parts of the home or add some features later. Perhaps reducing the size of some areas will make the home affordable. The interior finishing of a home is often what drives up the cost. If the plan calls for oak baseboards and casing, changing it to primed MDF trim can reduce your cost by thousands. There really is a lot that you have to consider when choosing a plan for your new home and I really like a lot of the suggestions the article makes. In particular, I really like that the article goes over how important storage space is when designing a new home. After all, regardless of how simple you live, you are likely going to have a lot of stuff and, because of that, you need to have space in your home to store it.